Farmer Rebecca Thistlethwaite and her family never anticipated that they would start a family farm, scale it 430%, and then close it all within six years. But then, who would? Despite their farm's closing, the light at the end of their 80-hour farming workweek tunnel turned out to be enlightenment. She, her husband and daughter took a year off of farming not to rest, but to search for the most innovative and successful farming models across the U.S. Their time off-farm allowed Rebecca to manifest the essential handbook for starting and running a sustainable farm business, Farms with a Future. Thistlethwaite’s book is a literal farm-business boot camp for greenhorns and aficionados alike. Read it as a new farmer and you’ll avoid many of the pitfalls that new farms make. Read it as an established farm seeking to transition to local markets, and you’ll reap the benefits of starting your journey to becoming a truly community-supported farm. Not only does Farms with a Future get real honest, like Rebecca’s blog, but the book divulges farm dos and don’ts from a variety of farm types. Farms such as Bluebird Grain Farms in Washington, which grow and market heirloom grain varietals, share their discoveries over the years. And the dairy, Butterwork Farm, which is touted as “one of the most successful organic farmstead creameries in the nation,” is featured as a prosperous model despite the volatility of the dairy industry. If you want to serve your community food, you will need to get business savvy to do so. This is one of the main take aways of Farms with a Future. Each chapter will get you started on various considerations such as accounting and infrastructure, but clearly each chapter could have been its own book. Just know going in that you’ll have to go elsewhere for additional reading on the chapters’ themes, but as it turns out, this isn’t a bad thing. Creating the right foundation for your farm is an essential beginning to your business and this book covers it all. Rebecca opens by recounting how she and her family closed the farm to explore what successful farm businesses look like all over the country but is far from dreary – by the end of the book she and her family are taking what they learned to start a new farm. And this is great news. After all, we need more farmers to grow our country food, to be equally connected to community and land, and that can revel in the slightly-controlled chaos that is farming. I caught up with Rebecca to learn more about her book and to hear about the next iteration of farm that she and her family are in the process of starting. FJ: After reading your book, sustainability really takes on a new dimension as you include the farmer, local community, environment and economic viability in your definition. How have your thoughts of sustainability changed throughout your journey as a farmer and writer? RT: I first viewed sustainability just through an environmental lens until I had the opportunity to study abroad in Belize and do extensive traveling throughout Latin America in the 1990’s. Developing countries teach you that there is no separation of 'man' and 'nature', and that you can't have environmental conservation without addressing issues of power, poverty, land distribution, access to education, and other social issues. I also came back realizing that new models must be created here because sadly, most of the world tries to emulate First World consumerism and industrialization. The planet is doomed if everybody tries to live like a suburban soccer mom, to use the euphemism. We need more sustainable models- those are what I hope the rest of the world will emulate. Not our opulence, consumerism, and complacency. FJ: You’ve spent a few years researching some of the more successful sustainable farming operations out there. Are you seeing predominately new farmers making it work, or are multi-generational farms also making the transition to more direct markets and achieving greater economic viability at the same time? 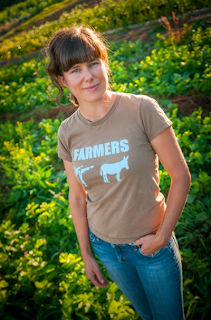 RT: I have seen both ­– I have seen many new farmers get started with a lot of enthusiasm, media attention, and high ideals only to succumb to economic realities a few years into it (my own farm in California was probably an example of that), and I have seen multi-generation farms try new growing practices and marketing techniques that are likely going to 'save their farms.’ And I have seen the opposite too ­– new farms who are smart and business oriented that will probably last and family-farms that keep repeating the same mistakes. I would say, overall, that trying to farm without any familial help is extremely difficult. If somebody plans to do that, they should at least have a strong network of friends who can help pitch in (labor & capital). In our own lives, we have moved to a place where we have stronger familial and social networks, giving us a fighting chance to get a new farming operation off the ground. We just did not have that in California (probably because we were working to hard to cultivate relationships well). Writing this book reinforced the idea of social capital – that is, the value of your social networks. FJ: Have you seen any parallels of things that don't seem to work? What are they and how can new farmers avoid these pitfalls? "There are more pitfalls to fall into than there are potholes in a farm road. The biggest one is probably not seeking out advice from other farmers and feeling like you have to make all your own mistakes."